"A THOUSAND WORDS WITH MICHELLE OBAMA", an empowering new special featuring former First Lady Michelle Obama in candid conversation with former Senior Advisor to President Barack Obama Valerie Jarrett at BET's annual Leading Women Defined symposium at the St. Regis hotel in Miami, FL. Sisterhood sets the scene as the women discuss a range of topics with Michelle reflecting on family, friendship and identity; the common thread of the evening being staying true to one’s self above all. The intimate conversation also touches on Michelle’s upbringing, raising a family in the White House and her coming of age as told in her highly anticipated autobiography, Becoming. 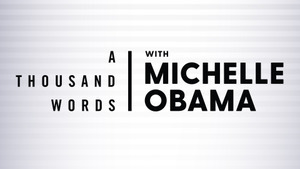 “A THOUSAND WORDS WITH MICHELLE OBAMA”, premieres Wednesday, December 5 at 9 PM ET/PT on BET.